"Trust my brain, not my eyes". So says the persona of Tom Walker in Delirium. 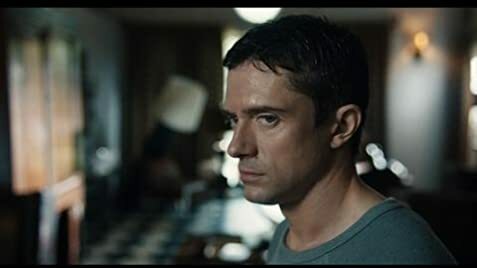 Walker (a rightly cast Topher Grace) loves his Fruity Pebbles, loves to sketch people, and loves his mid-90's college music. Sadly, he gets put through the ringer via Delirium with zero sympathy, solicitude, or empathy. Heck, he's like a wilted pinata that's smacked around and beaten at every turn. Eugene Levy said it best when he spouted the words, "what a week I'm having". Anyway, Delirium contains some blood-curdling moments that actually feel genuine. It has an elaborate mansion that almost acts as a main character. Delirium deals with brute force, hallucinatory effigies, suicide, and self-infliction. Finally, Delirium heralds a decent, sort of one-man show performance by the everyman-looking Grace. 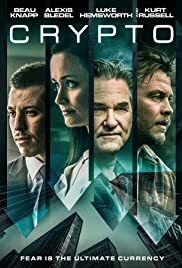 Added to that, veteran actress Patricia Clarkson is effectively nasty as a kooky probation officer with schizo motives. 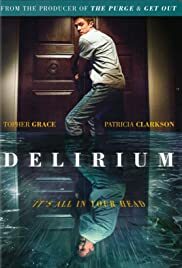 Released by way of Internet in the U.S., containing a bit of dry humor, and directed by Athens, Greece native Dennis Iliadis, Delirium involves Tom Walker (mentioned earlier). Walker is a medicated, mental patient with a psychotic older brother that's doing time for murder. Tom gets put on house arrest at his dead parent's abode for thirty days. If Tommy boy can survive with ankle monitor and haunted images in tote, he's home free and doesn't have to go back to the creepy institution for which he was temporarily allowed to leave from. Delirium's premise is a little silly, a little far-fetched, kinda plot implemented, and highly unlikely. Still, the film (at times) seems hair-raising and vaguely original considering the countless other scare fests that have come before it. In total veracity, Delirium reminded me slightly of The Shining, 1986's House, any Saw movie, and 2007's 1408. I'd recommend the flick had it not been for its downer ending that kind of lacks some real resolution. As a viewer, you experience a lot of bruises and blackening while taking in Delirium. By the time the end credits roll out, you'll wonder if it was actually worth all that effort. In retrospect, Delirium mildly succeeds as a fun-house horror flick that eventually turns into an off the rails thriller. Yeah Delirium may have too many implications, it might be a little too mean-spirited towards its lanky protagonist, and it may possess too many icky twists. Oh well. It's at least equivalent to a two and a half star rating.